The downside to buying an older home, no matter how charming, is the lack of closet and storage space. 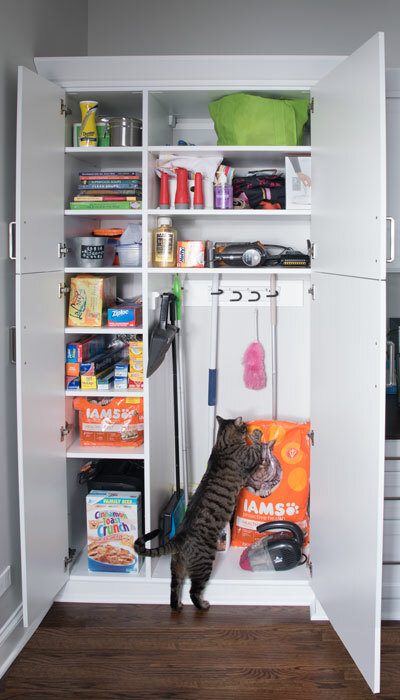 This one had no pantry or utility closet anywhere on the first floor. The home had a room off the kitchen, which may have originally begun life as a back porch but had been enclosed and insulated at some point. 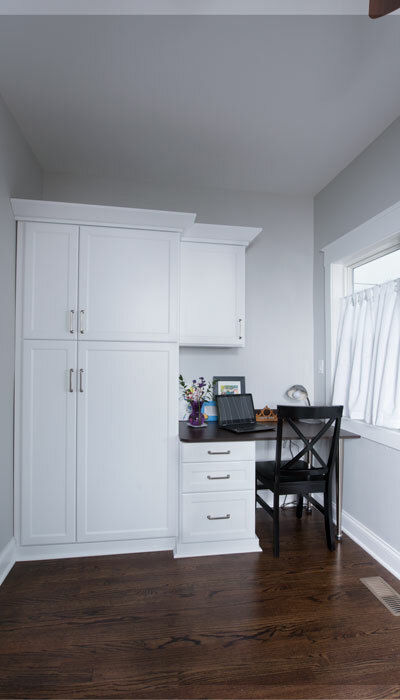 The client was thinking of repurposing this sunroom space to incorporate these two necessary closets, plus a mud room and an office/desk area as well. While some home owners would use at least a portion of this area as a breakfast nook, with a built in bench around a table, this client had no desire to have a breakfast table as there was already a separate dining room very near the kitchen. An office space was much more practical for her needs. 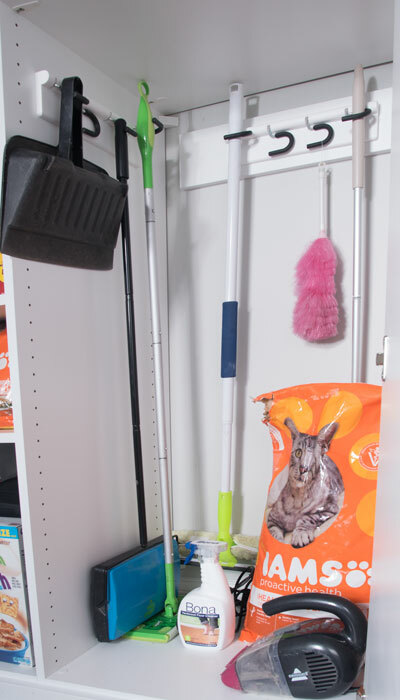 Also, a mud room area to handle the coats, shoes and gardening paraphernalia that would inevitably accompany the soon to be cultivated back yard was desired as well. Of course, it all needed to match the existing kitchen cabinetry as closely as possible. The sunroom had already been opened to the kitchen on one side, leaving only the east wall and a west wall for possible storage, as the south wall was comprised of a sliding glass door and windows. Construction details include: making our upper cabinets shallower than the existing kitchen cabinets in order to open up the space; adding crown and base molding that echoes the original as closely as possible; the way the mud room bench is left open over the floor vent; lining up the bottom shelf of the mud room's upper cabinets with the bottom shelf of the upper cabinet over the existing refrigerator; making the pantry and utility cabinet doors split horizontally, but doweled together to open as one, with the split at the same height as the upper cabinet above the desk for symmetry; opening the right side of the desk, under the counter, with adjustable brushed stainless steel legs to increase leg room. 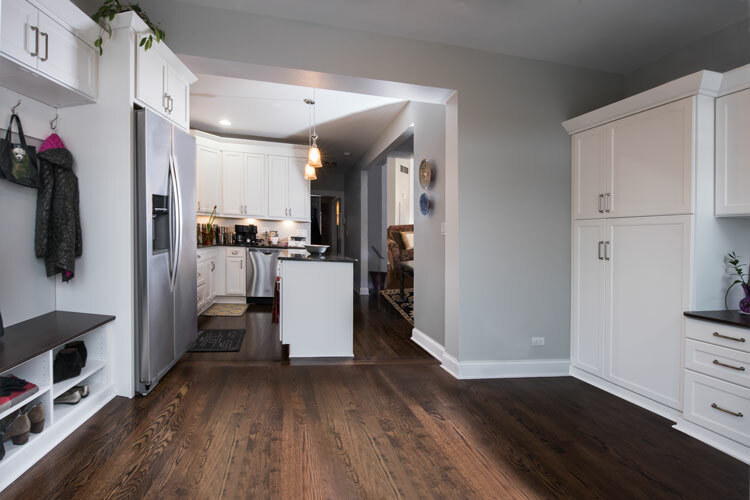 Matching the finish and door styles to the already renovated kitchen was an obvious choice for the new mud room. Regal doors and white laminate worked best and suited the budget. 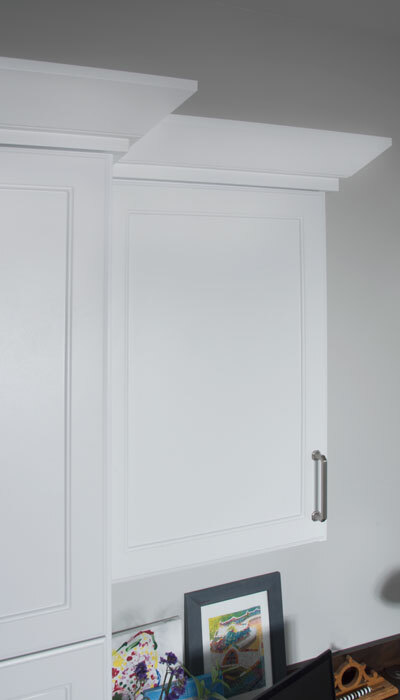 Making our upper cabinets on the mud room wall directly abut and attach to the existing kitchen cabinets while adding a similar crown was a challenge. That required mathematics and exact dimensions of the depths of both cabinetry, the height both of the existing crown moldings and their reveals, and how the two would interact. Closet Works decided to design the upper cabinets less deep and less tall than the kitchen cabinet we were abutting, so that it would seamlessly transition and would feel as though it had always been a part of the architect's original vision and materials, even though there was a step-down and a step-back. 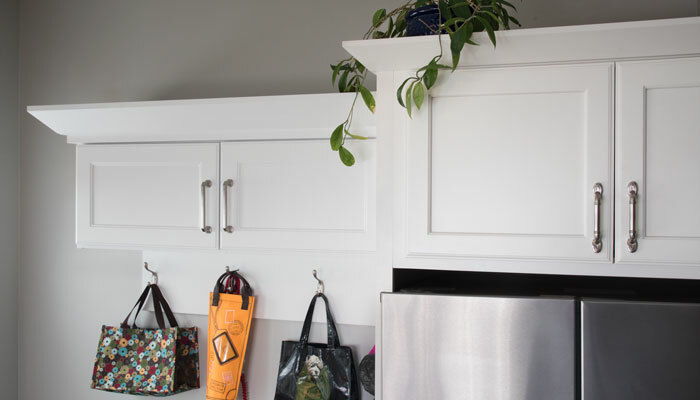 To counteract the aesthetic noise with all of this step-back/step down, we used horizontal symmetry by lining up the bottom shelf of the mud room's upper cabinets with the bottom shelf of the upper cabinet over the existing refrigerator surround. This offered the opportunity to open up the center of the sunroom, bringing a sense of calm to the space. 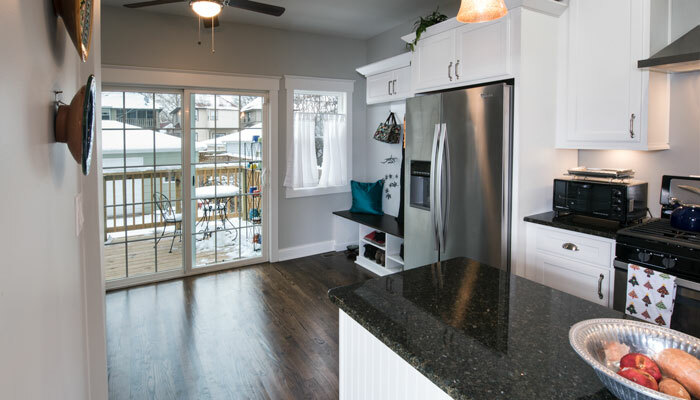 Additionally, the tight circulation space between the kitchen cabinets and island could now open up into a spacious multi-functional sunroom. As an added aesthetic touch, to break up the monotony of white, a cocoa wood-grain laminate finish was chosen for the seat on the bench to compliment, but not match, the stained oak floors. 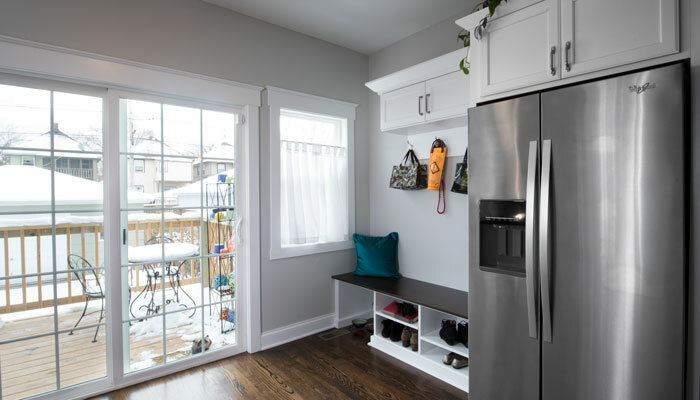 The challenges in designing the mud room bench were the floor vent under the window and the limited space available to work with between the wall, architectural base molding, and a floor vent. 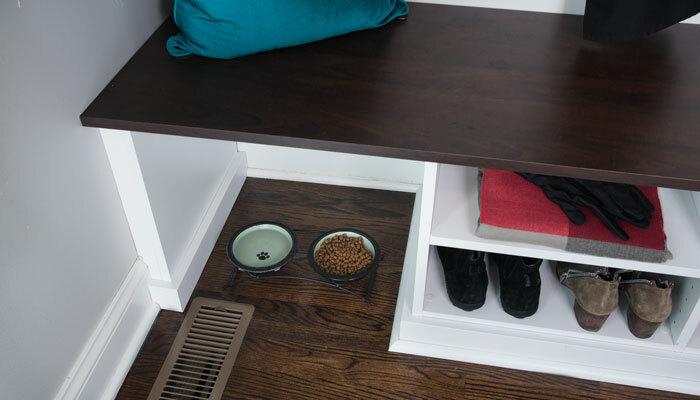 As uneven hardwood floors require base and shoe molding on our systems, we decided to leave that section open, not only for the ventilation, but as it happened, it was the perfect size for Fido's food container. 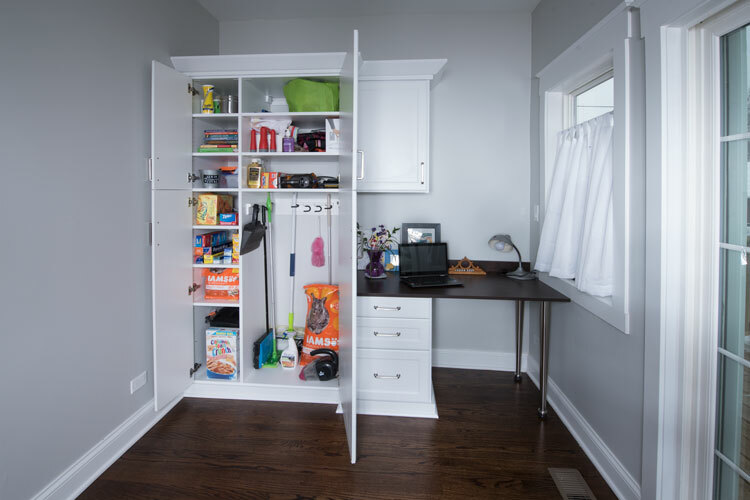 Creating the pantry/utility closet and desk space provided a different challenge as we were not abutting existing cabinetry. 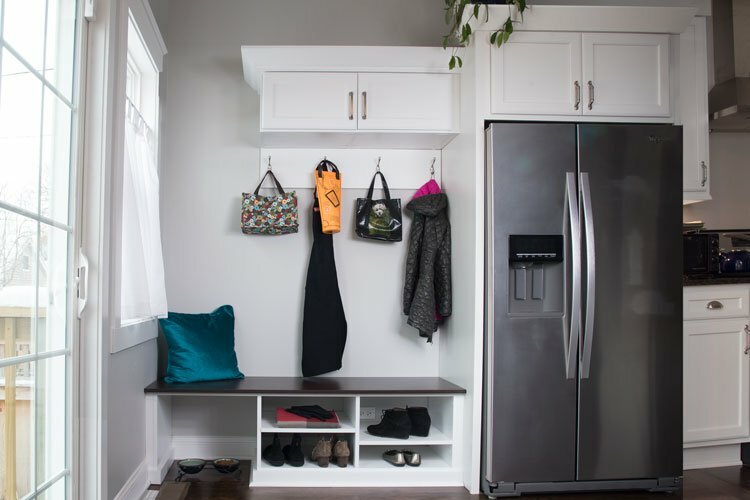 However, it offered the opportunity to employ the same design technique as used on the mud room wall — stepping a portion of the system back and making the upper cabinet less deep, thereby visually opening up the sunroom. The larger sections of the new built-in closet were positioned nearest to the kitchen, and the seemingly less deep sections closest to the wall of glass doors and window giving the feeling of walking into a much larger open space that leads to the world outside. 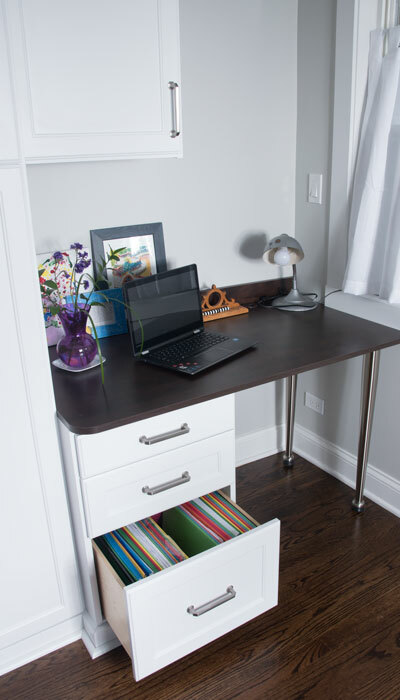 The cocoa wood-grain laminate desk countertop, which matches the cocoa mud room bench seat directly across on the opposite wall, helps maintain this illusion even though the desk top and drawer cabinet are actually deeper than the tall cabinets themselves. With all of the step-backs and step-downs going on we felt the need for more clean and delineating lines, so we chose to make the pantry and utility cabinet doors split horizontally, but doweled together to open as one, with the split at the same height as the upper cabinet above the desk — thus retaining the sense of symmetry. Keeping the pantry cabinet and the utility cabinet separate (food vs cleaning products brooms and mops), was relatively easy in concept, but we needed to ration the space in order to leave room for a proper desk with drawers. 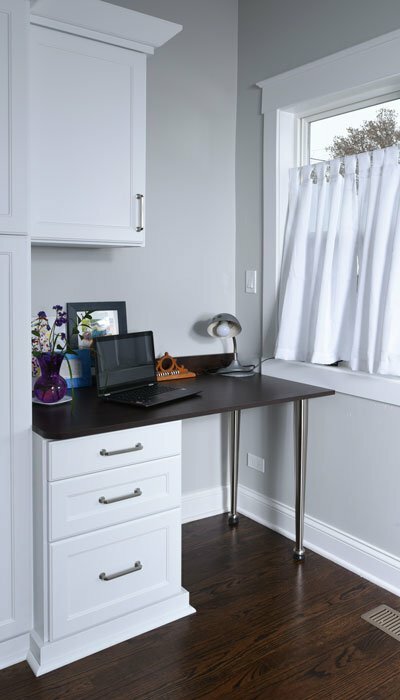 Closet Works conferred with the client about the desk, measuring her in her current work area to determine exactly how much space she would need. The proper 42" of human dimension for a desk seating area was more than the room would allow. Together we brain stormed how best to give more leg space under the desk top. We opened up the right side, under the counter, with adjustable brushed stainless steel legs rather than another panel of laminate which would have made that area tighter and more constrictive. The same idea was used when deciding the stopping point of the cabinets over the desk in relation to the windows. They were kept far enough away to allow the negative space to open up the room, allowing natural light to enter unencumbered. 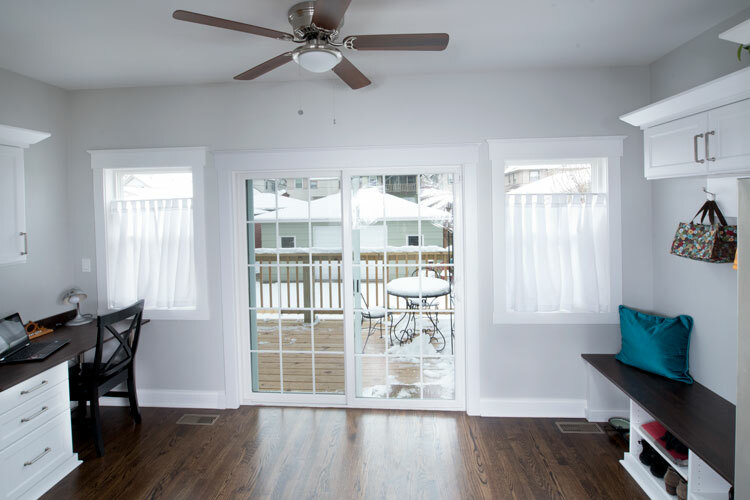 Our goal of having the sunroom feel open — not allowing the closet systems to block light from streaming in — while still using the space as effectively and efficiently as possibly was successfully achieved. As a result, there is an Alice in Wonderland-esque feeling as the room effortlessly expands from small to incredibly wide open and spacious.